These glasses feature iconic industry vocabulary and their satirical definitions. We've all heard the aphorism: "It's not what you say, it's how you say it." 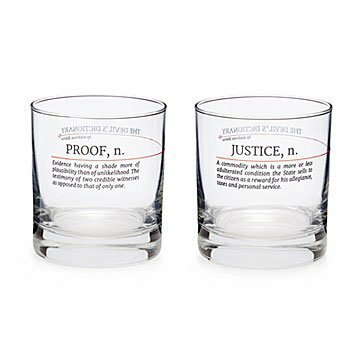 These double Old Fashioned glasses say it with class, and a little sass, thanks to writer Ambrose Bierce's humorous definitions. Decorated with terms "defined" in the writer's satirical Devil's Dictionary, which was published in 1906, each set of two glasses focuses on a specific industry: law, medicine, or finance. A subtle pitchfork adds a touch of devilish detail to the end of a slim, red line that wraps around to the other side of the glass. Glassware made in the US. Decorated in Pittsburgh, Pennsylvania. 3.5" H x 3.25" diameter; 11 oz. I gave this as a housewarming gift for someone who already has it all. As a clever gift for a lawyer- just a rare and neat idea. Wonderful gift but handwash only! This was the perfect gift for my husband who is an attorney. Unfortunately after second wash on delicate cycle of our dishwasher, the sealant began to peel. I did place them on top rack. So, i would recommend hand wash only as now the glasses are unattractive. The glasses came nicely gift boxed and in great condition I was concerned they would not arrive on time, but they did.. I will definitely order from Uncommon Goods again! She uses them for entertaining. Great for entertaining. Nice on a bar cart! Great gift for a lawyer. My son bought this for his Dad for his birthday. It's a very unique gift that you can't find in a store. Who doesn't love the Devil's Dictionary? On my third try, this popular item was not on back order. I finally snagged a set as a little surprise for a newly minted attorney. The glasses were a huge hit. I brought this gift for a family member that just graduated from law school. I thought it was fun and entertaining. I like your products for their uniqueness and practicality. They are loved by everyone I have gifted them to & also in my own home. They are of good quality and affordability. Got this for a good friend who just graduated law school & passed the bar and loves whiskey. She loves them! They *are* dishwasher safe, but to maintain the looks of the text, I would recommend hand washing.